Unique experiences Skyrail – The Edge Lookout Dare to stand on a transparent boardwalk 160 metres above the Barron Gorge at The Edge Lookout for an unimpeded panoramic view of the Barron Falls, north of Cairns. skyrail.com.au KUR-Cow Barnwell Farm Kuranda’s newest experience visit KUR-Cow Barnwell Farm for hayrides, cattle feeding, arena horse and cattle show, mini animal farm, ATV (Quad Bike) and Horse Riding. kurcowfarm.com Hartley’s Crocodile Adventures 85th Birthday The award winning ecotourism attraction celebrates its 85th birthday in 2019! With over 2100 metres of timber boardwalks and pathways leading you on a journey of discovery through woodlands and rainforest where you can see an array of wildlife. crocodileadventures.com Spirit of Cairns The ultimate waterside dining onboard the luxury 26m sailing catamaran, the Spirit of Cairns. Offering evening dinner cruises, it is the perfect way to end a perfect day in paradise. Sunday lunch cruising is also available. spiritofcairns.com.au Quicksilver Dive School A purpose-built dive training centre on the door step of the Great Barrier Reef in Port Douglas, offering a range of PADI accredited courses; from entry level to advance courses. Dreamtime Dive and Snorkel Step back into the Great Barrier Reef’s Dreamtime with Indigenous sea rangers on a day tour to two spectacular outer Great Barrier Reef sites. Back Country Bliss Adventures This Port Douglas company offers a range of tours to the Daintree National Park and Cape Tribulation including river drift snorkeling, bushwalking tours, rainforest tours including a half day Cape Tribulation tour. Fantastic choices for the nature lover. Fitzroy Island – Eye Spy Exclusive scenic sailing cruises showcasing the sun setting over two World Heritage Areas from Fitzroy Island Resort. Catering to 20 people, the catamaran Eye Spy sails on the Great Barrier Reef for a stunning view of the sun dipping behind rainforest-clad mountains. Blue Dive Jump onboard the Choo Choo Explorer catamaran in Port Douglas for a relaxed sunset cruise and captivating stargazing experience under the stars. fitzroyisland.com Barramundi Discovery Centre Hand feed giant barramundi and visit a fish hatchery at the Les Wilson Barramundi Discovery Centre, a spectacular interpretive centre in Karumba, the outback town by the sea. The centre showcases the local wetlands and mangroves, birdlife and flora of the southern Gulf of Carpentaria. barracentre.com.au Sunlover by Starlight Experience Australia’s most unique small group adventure, an overnight Great Barrier Reef glamping experience. Wrap up in your deluxe swag under the brilliant stars of the southern night skies and awake to an epic sunset afloat the Sunlover multi-level, stateof-the-art activity Marine Base at the exquisite Moore Reef. bluedive.com.au/stargazing Nautilus Aviation – Helifish A unique experience for the avid, “fair dinkum” fisherman. Your personal helicopter accesses exclusive fishing spots from river to reef. nautilusaviation.com.au Jarramali Rock Art Tours An up close and personal Aboriginal cultural experience, exploring the Quinkan Rock Art sites found among the sandstone escarpments around the small town of Laura, North Queensland. jarramalirockarttours.com.au Brett’s Outback Tasting Adventures Offers guests a small and personalised tour of the Atherton Tablelands. Eat your way through this tropical food bowl, visiting wineries, award winning distilleries, dairy properties and coffee plantations. Heli Pub Tour See and taste what the Atherton Tablelands has to offer on this Heli Pub Tour, visiting four Queenslander pubs, flying over volcanic crater lakes and stopping at award-winning Mt Uncle Distillery. Thala Beach Nature Reserve An award-winning eco-retreat offering guests special experiences: Indigenous story-telling, stargazing and unique nature and wildlife walks. Wildlife Habitat – Predator Plank The new Predator Plank at Wildlife Habitat Port Douglas allows visitors to test their courage as they “walk the plank” over crocodile-filled waters. Billy Tea Safaris – Chillagoe and the Outback A full day spent exploring the Tropical North Queensland outback – lunch in an Aussie pub, guided tour of the Chillagoe-Mungana limestone caves, Aboriginal rock art and wallaby feeding. Cairns & Great Barrier Reef events Undara Rock & Blues Festival 25–27 April 2019 A selection of some of Australia’s best rock and blues artists against the backdrop of the rugged Outback. A truly unique and must-do event. Cairns Airport Adventure Festival 6–10 June 2019 A week long sporting festival in one of the world’s most iconic tropical destinations culminating in the Cairns Airport Ironman Asia-Pacific Championship. Cairns Indigenous Art Fair 12–14 July 2019 Aboriginal and Torres Strait Islander voices will sing in their languages at Cultural Heights, a new event for the Cairns Indigenous Art Fair, which celebrates its tenth anniversary this year. Indigenous artists from across Queensland exhibit at the prestigious fair. Cairns Craft Beer Festival 11 May 2019 The inaugural Cairns Craft Beer Festival will bring five local breweries together at Hemingway’s Brewery on the Cairns wharf. More than 20 craft beers and a special collaboration brew will be served along with local food and music. Targa Great Barrier Reef 30 August – 1 September 2019 Targa Great Barrier Reef will return to the tropics after a hugely successful launch in 2018. 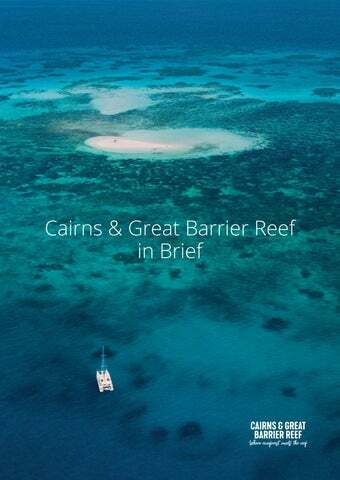 It will be an event like no other as it passes through landscapes that are truly unique to Cairns & Great Barrier Reef. World Rafting Championships 13–20 May 2019 White water speed demons will try to tame the Tully River in May 2019 when the World Rafting Championships are held for the first time in the world’s oldest rainforest. Teams from 30 countries will descend on the Cassowary Coast for the eight-day event. Reef Feast Palm Cove 4–6 October 2019 Over three days Palm Cove’s Reef Feast presents an explosion for all the senses – innovative cuisine, fresh produce, music and a relaxed atmosphere along the beautiful palm fringed Palm Cove beach. Unique experiences/adventures, Accommodation updates, Cairns & GBR events and new self-drive itineraries.